A memoir by the NBA Hall of Fame player, active from 1977-1993 and widely regarded as one of the all-time great New York Knicks. NBA Hall of Famer Bernard King is one of the most dynamic scorers in basketball history. King was notoriously private as a player, and rarely spoke to the press-not about his career and never about his personal life. And even beyond his prolific scoring, King will forever be remembered for the gruesome knee injury he suffered in 1985. Doctors who told him he'd never play again were shocked when he not only became the first player to return to the NBA from a torn ACL, but returned at an All Star level. In Game Face , King finally opens up about his life on and off the court. In his book, King's basketball I.Q. is on full display as he breaks down defenses using his own unique system for taking shots from predetermined spots on the floor. King talks about matching up against some of the all-time NBA greats, from Michael Jordan, Julius Erving and Charles Barkley to Larry Bird, Patrick Ewing and many others. He also tackles issues of race and family off the court, as well as breaking a personal cycle of negativity and self-destructiveness with the help of his family. 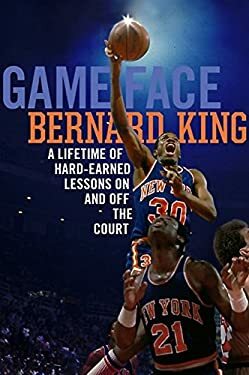 Engaging, shocking, revelatory, yet always positive and upbeat, Bernard King's memoir appeals to multiple generations of basketball fans.